Being chosen for The Testing is the highest honour for new graduates. 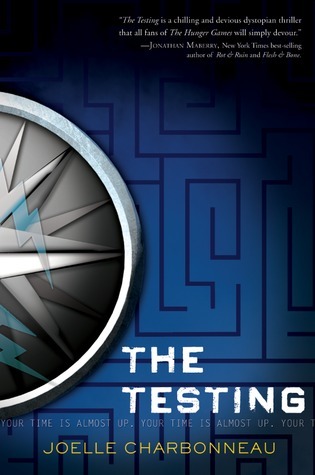 The Testing will decide who will go on to the University, to become the next generation of leaders, who will work to restore the earth and society in the aftermath of devastating world wars. Cia has looked forward to this opportunity her whole life, but the night before she is to leave for the Testing, her father tells her about the nightmares he's had since they wiped the memories of the Testing from his mind. Suddenly, Cia's mind is filled with questions. What happens to the candidates who don't pass the Testing? Why are memories of the Testing wiped at the end? Who can be trusted? Normally when I hear that a book is recommended for fans of *insert popular series here*, I end up disappointed. Not the case here! This book is recommended for fans of the Hunger Games, and as a Hunger Games fan, I heartily agree. While I've seen some reviews saying that this story is too similar to that of the Hunger Games, I found that, while the setting was similar, the idea was really original. The idea of choosing a country's future leaders by putting them through intense physical, mental, and emotional testing is really fascinating. This is definitely a dystopia, with a government that callously watches as people die. Yet you can still see how the Testing could have been a good idea (if it wasn't done in such a horrifying way), giving the whole thing a certain realistic feel. The writing is excellent as well. I was sucked right in, and flew through this book. I can't wait for the rest of the series, and I've already downloaded the free prequel ebook. Full disclosure: I received a free ebook copy from the publisher through NetGalley.